The market town of Hitchin is home to an array of beautiful homes, as one would expect from such a cultural hub. Our local team at Just shutters are experts in Hitchin Plantation Shutters and understand that your home is your pride and joy and as such, our passionate experts are on hand to carry out a free home design visit and consultation. We will develop your vision and produce beautifully bespoke shutters for your home. Call your local Hitchin Plantation Shutters expert Tom Parrott (pictured below) today to arrange a home design visit on 01727 221 298. Furthermore, we ensure that all our shutters are bespoke made to measure products, ensuring you get the perfect fit for any shaped windows in your home – our experts will bring samples during a home design visit and can even colour match your interiors. Additionally, all our shutters come with a lifetime guarantee! Get in touch with Tom Parrott Just Shutters Herfordshire MD, for more information and to book a free home visit. During the visit, we can show you all you need to see, consequently getting a real sense of how our shutters will work in your home. Call 01727 221 298 request a brochure or get an online shutter quote estimate now. WHY CHOSE JUST SHUTTERS HITCHEN? It is simple – Just Shutters Hitchin have an outstanding reputation and extensive range of shutters. 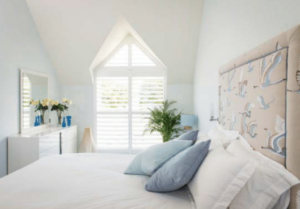 Our experts in Hitchin Plantation shutters would be delighted to hear from you and work with you to achieve your vision of the perfect interior. call us on: 01727 221 298 to discuss your next steps and book a home design visit. Our Hitchen Plantation Shutters experts are immensely proud of the feedback and reviews they regularly receive from their happy customers, read some of the positive testimonials for the team below.